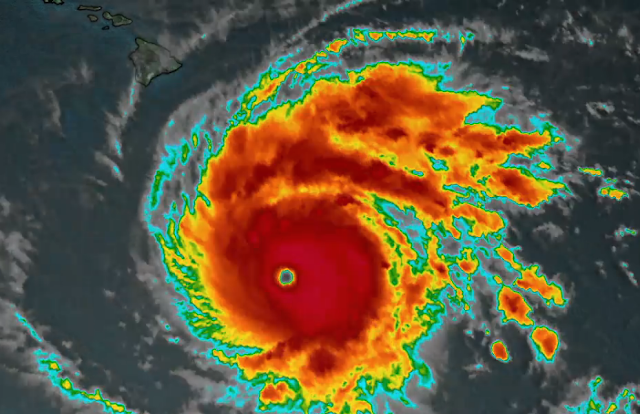 Hurricane Lane weakened as it marched toward Hawaii, but its list of life-threatening calamities is still going strong. The hurricane was downgraded to a Category 3 storm Thursday, even as it unleashed torrential rainfall, flooding, and landslides over parts of Hawaii’s Big Island, along with dangerous surf and high winds. The conditions continued early Friday. Ryan Leinbach of Kailua-Kona said he “brought everything that might fly” indoors and stocked up on wine, cheese and coffee. Despite the flooding and landslides making headlines nationwide, some tourists were unfazed, with nearly 300,000 currently visiting the state, U.S. Sen. Mazie Hirono said Thursday. Between 10 to 30 inches of rain is forecast in some areas through the weekend, which could trigger even more landslides in parts of the Big Island. A mix of a storm surge and waves will raise water levels well above normal tide levels, with surf heights of 10 to 20 feet forecast along some coasts.